Pure first showed off its colorful multiroom streaming audio devices at CES in January, and started shipping the first models in June. On Tuesday, the company announced two new speakers to look forward to, plus a subscription music service to rival the likes of Spotify and Rdio. The two new wireless multiroom speakers are the Jongo T2 and T6. The $149 T2 is a small speaker with 3-inch mid-range drivers and Class D amplification. 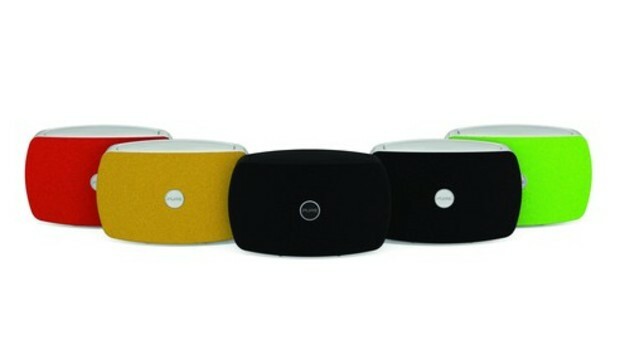 The $349 T6 is a larger model with dual concentric loudspeakers and two 5.25-inch full range drivers. Optional stands and wall mounts let you position the speakers where and how you want to best suit your listening environment, and clip-on covers in burnt orange, lime green, or mango cost $20 a pop. The second part to Tuesday's news is that Pure is finally bringing its on-demand subscription music service to the U.S. (it's already available in the UK and Germany). The Pure Connect Blue service will cost $5 a month when it becomes available in September, offering access to more than 15 million streaming tracks, while the $10-a-month Pure Connect Violet plan adds in offline listening on Android and iOS devices. Those prices are on a par with similar subscription services. At the same time, the free Pure Connect Green option offers access to more than 20,000 radio stations and 200,000-plus free on-demand programs and podcasts.